Transplant diagnostics are a critical prerequisite for organ transplant procedures. These tests are extensively used to study the compatibility between the organ donor and recipient. Transplant diagnostics also play a crucial role after the transplant procedure. Organ rejections post-transplant can lead to severe complications. Diagnostics at every stage of the transplant procedure can help medical practitioners protect the patient’s health by reducing the possibilities of organ failure. A new analysis by BCC Research shows that the global transplant diagnostics market was valued at $512.3 million in 2015 and is expected to grow at a compound annual growth rate (CAGR) of 9.8% from 2016 to 2021. An increase in the incidence of chronic diseases, which can lead to organ failure, has increased the growth potential of this market. The rising number of organ donations and transplant procedures worldwide will lead to further growth in the transplant diagnostics market. Certain parameters, however, constrain growth of this market. For example, while there is an increasing need for organ transplants, there is still a shortage of organs worldwide, which limits the number of transplant procedures performed. This, in turn, has an effect on transplant diagnostics procedures. A growing number of candidates on waiting lists for organ transplant procedures worldwide further widens this gap between the number of organs available and the number of organs needed. Other factors, including the high cost of instruments and limited insurance and reimbursement coverage for transplant processes, are also expected to hamper growth of the global transplant diagnostics market. There has been a high adoption rate of nonmolecular assays, such as serological assays and mixed lymphocyte culture assays, compared with molecular assays. Thus, the transplant diagnostics market as segmented by technology was dominated by nonmolecular assays in 2015. However, this scenario is expected to change during BCC Research’s forecast period, with molecular assays taking the lead in the technology segment of the transplant diagnostics market. 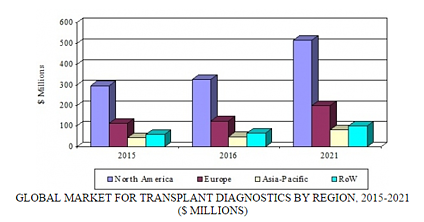 By region, the transplant diagnostics market is expected to experience rapid growth in developed economies such as the United States and Europe. Constant initiatives by government bodies, medical associations, and major players in transplant diagnostics are spurring market growth in these two regions. Nonetheless, both regions face challenges due to a lack of awareness and information on the importance of organ donations and transplant procedures, which is pivotal for growth of the transplant diagnostics market. An increase in the number of chronic diseases is expected to boost the transplant diagnostics market in Asia and in other developing parts of the world. Sequencing offers high levels of resolution and accuracy in transplant diagnostics. In addition, sequencing can be used to monitor rejection of an organ transplant at early stages and thereby prevent the patient from contracting serious health issues. DNA from the transplanted organ is present in a patient’s bloodstream. When a rejection is under control in a healthy patient, less than 0.5% of the DNA detected in the patient’s bloodstream is from the donor. When 2% of the DNA detected is from the donor, there is an 80% chance of graft rejection. The presence of donor DNA in the patient’s bloodstream allows detection of organ rejection far earlier than by other symptoms of rejection. The use of sequencing to monitor graft rejection reduces the use of invasive assay methods such as biopsies. For example, in cases of endomyocardial biopsy, a small tube is threaded through the blood vessels and a small piece of heart tissue is cut out for analysis when the tube reaches the heart. Invasive assay methods can be very painful as well as risky for patients. As a result, scientists are working on noninvasive methods. The use of biomarkers will figure significantly in the future of the transplant diagnostics market. In many transplantation cases, the patient’s body starts to produce antibodies against the transplanted organ, despite the use of immunosuppressant agents. As a result, graft rejection occurs, and the patient needs another transplantation surgery to live a healthy life. The major reasons for graft rejection are not yet known. In such cases, biomarkers can be helpful in identifying the possible causes of chronic allograft rejection post-transplantation. Biomarkers are also useful for better matching donors with recipients, as well as for assessing the patient’s risk of graft rejection. A post-transplant allograft rejection progresses over time. Early detection of allograft rejection is beneficial for the long-term functioning of the transplanted organ. Biomarkers used after transplantation are dynamic and have a high threshold because it is not possible to detect the damage as soon as it happens. Novel biomarkers used for transplantation need to have high sensitivity and a low threshold to overcome this problem. Approximately 15,000 studies have been done on biomarkers with respect to solid organ transplantations. However, only two biomarker tests are approved by the FDA. One is a functional immune assay, and the other is a noninvasive blood test for heart transplant patients. Biomarkers have a long way to go in this field. After development and validation of a biomarker, it takes a long time to obtain approval for its clinical use. A significant unmet need exists for noninvasive diagnostic tools to monitor transplant recipients, especially for early detection of active injury and rejection. A new study in The Journal of Molecular Diagnostics describes a noninvasive test that measures donor-derived cell-free DNA (dd-cfDNA) in plasma. It has the potential to reduce complications and rejection, and thereby improve outcomes in transplant recipients. “dd-cfDNA is an emerging biomarker of transplanted organ injury, and the availability of a clinical-grade, analytically validated assay is critical for advancement of this biomarker toward improving the outcomes of transplant patients,” explained lead investigator Marica Grskovic, PhD. The assay detects plasma dd-cfDNA within the range of levels evident from transplant patient samples. Because it is a next-generation sequencing–based amplification assay, it does not require determination of the donor’s and recipient’s genotype, a process which needs significant time, cost, and tissue availability. Monitoring a transplanted organ by tissue biopsy, an alternative to DNA detection, is invasive, also time consuming and costly, and risky. The dd-cfDNA assay can be completed within three days, which can be important for clinical decision-making. The authors presented data from a multicenter heart transplantation study showing that dd-cfDNA was, on average, three-fold higher in patients experiencing acute rejection than in stable transplant recipients without acute rejection. A decrease in dd-cfDNA levels upon successful antirejection treatment was also observed. The researchers expect the assay to be useful for monitoring other types of transplanted organs. Additional multicenter observational studies for heart and kidney transplant patients are underway to further evaluate the assay’s clinical validity and utility. The assay is currently validated only for single organ donor/recipient pairs. “These results show promise in using cfDNA not only to detect rejection, but also to monitor response to treatment. The ongoing measurement of cfDNA may allow clinicians to better personalize care, adjust immunosuppression regimens, and improve the long-term outcomes of transplant recipients,” noted Dr. Grskovic (ScienceDaily; October 10, 2016). BCC Research’s new study, Transplant Diagnostics: Technologies and Global Markets, analyzes global market trends, with data from 2015, estimates for 2016, and projections of CAGRs through 2021. Novel approaches such as biomarkers, bioprinting, and organoids are evaluated; marker drivers, restraints, and opportunities are examined; and major players in the field are profiled.